Drake Road Races (2019) - AllSportCentral.com - Registration. Results. Relax. Mark your calendars for the 51st annual DRAKE ROAD RACES on Saturday, April 20, 2019! We're ready to start running the next half century of this local road race and continuing its historic connections! 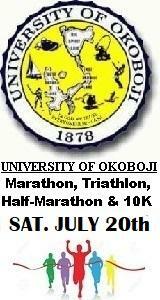 The 5K, 10K and half marathon distances all return and finish in Drake Stadium on the world famous Blue Oval. All three races highlight the beautiful Drake campus and the heart of Des Moines. The 5K and 10K races are both flat and fast and our half marathon is a scenic fan favorite featuring the charming Waterbury and Beaverdale neighborhoods. Each participant will receive a specially designed long-sleeve quarter-zip and all runners receive a finisher's medal. Friends and family can cheer your finish from easily accessible stadium seating.